Make salad dressing by mixing all ingredients in a small container with a lid so you can shake it (a small jar with a lid is ideal). Peel and cut the mango. Tip the leaves, vegetable and fruit into a bowl but don’t mix it. Sprinkle with nuts and seeds. Tip: mix the salad directly before serving otherwise the leaves won’t look fresh. 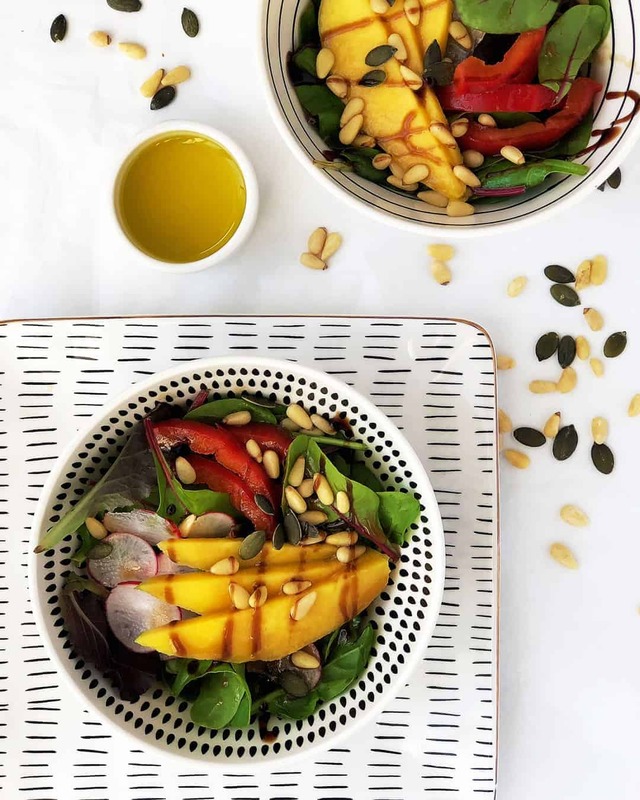 This salad recipe is combination of fresh leaves, vegetables, mango, pine nuts and our homemade salad dressing. It’s full of varied textures and balanced flavours. We love it as a side dish for the main course. How to Make a Good Salad at Home? There aren’t any rules for how to make the best salad but I like to follow a few steps to make sure I won’t end up with a boring, sad salad. I believe a really good salad is colourful and filled with different textures (crunchy, hard, soft, smooth, mushy). I generally use a mix of green leaves and fresh herbs with a few other types of vegetables like peppers, tomatoes, cucumber, radishes etc. They add more vitamins and nutrients but they also add some pretty colours to the mix. Thinly sliced onion gives the salad nice sharpness but beware that it can also give you lots of wind. Fresh herbs add a nice touch of flavour to any salad mix. A great way to make a salad more exciting is to add some fruit to it. Any fruit really – fresh or dry. You can try apples, pears, plums, avocados or you can experiment with all sorts of berries. My favourite fruit for a salad is fresh mango. I like its sweetness, bright orange colour and soft texture. I think it’s a great companion to crunchy vegetables and tangy salad dressing. As a next step, I use some nuts and seeds for my salad mix. One type of nut is often enough to give the salad that right balance of flavours and textures. Possibly the most important step in making a tasty salad is a salad dressing. A good dressing can help to transform any average salad to an exceptional one. We are currently in love with our (4 ingredients) homemade honey-mustard dressing. Of course, the ingredients I put into our salads depend on the occasion and a type of meal I am making. A side dish salad doesn’t have to be filling. For our light lunch salad, I like to use some chicken or cheese to make it more satisfying. If we have salad as our main meal I mix in some grains, rice or roasted potatoes too because I don’t want to feel hungry after an hour. I guess the list can continue on and on but you get the idea. The best recommendation I can give you is to be creative. There are so many options to choose from. 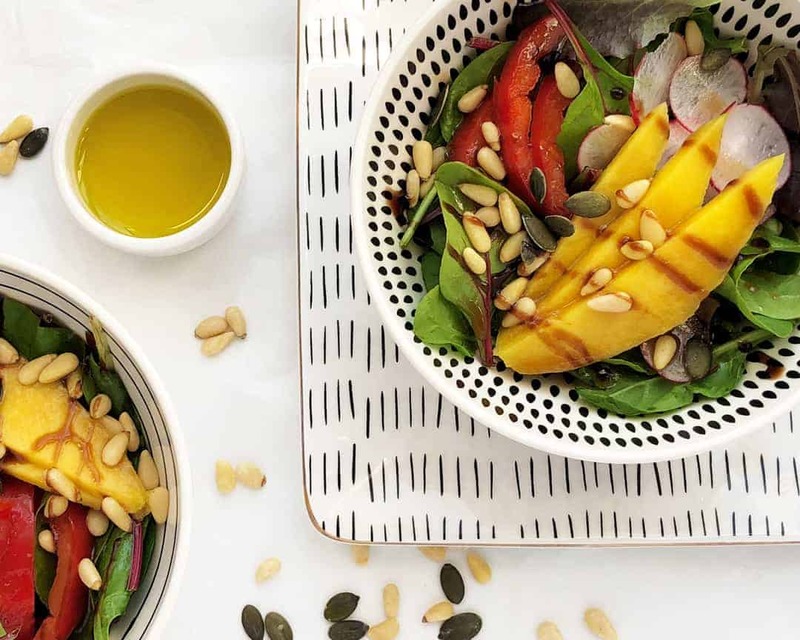 In the meantime, you can always start with our Green Mango, Pine Nuts Salad.